Reserve Bank of India (RBI), architect of the nation’s economy requires manpower for its operations and carries recruitment examinations periodically inviting interested candidates over the country. It works towards the economic and financial growth of the nation through the host of duties and responsibilities it carries on an everyday basis. The Grade B Officers are handling the day to day activities in the bank like maintaining the cash inflow and maintenance of order in the bank. They also are responsible for the overlook of the swift functioning of the member banks of under the RBI in the country. Candidate joining as a Grade B officer will get Basic Pay of Rs. 37,000/- per month (approx.) along with other allowances. Gross Pay Scale would go between Rs. 64000 to Rs. 75,000/- per month. An RBI Grade B Officer will be provided RBI Residence, Fuel Allowance, Medical Allowance, Monthly Maid allowance, Tour Allowance, Food / Grocery Offers as per norms are given by RBI Govt of India. 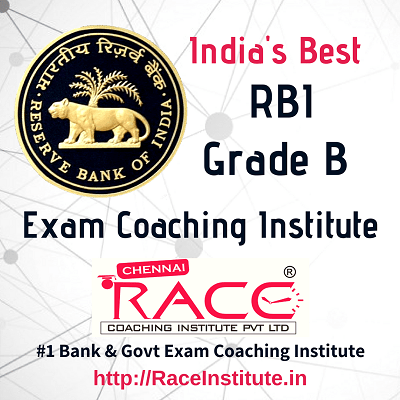 RACE Institute, a pioneer Institute for Bank & Govt Competitive Exams provides the best coaching for RBI Grade B Officer Examination in all the Branches of RACE Institute. We received “6 Best Competitive Exams Coaching Institute in India” award from Time of India & other organizations like Blindwink.in, Praxis Media, etc. Students joining RBI Grade B Officer Exam Coaching in RACE, will also able to crack all Bank PO, Bank Clerk, and Insurance Examinations as well. Because the Coaching methodology used for RBI Grade B Officer Exam will make you crack any Bank & Insurance Exams. The facilities & Practice Programs in RACE institute will surely get you a Bank / Insurance Job. Want to become a Grade B Officer in RBI? Selection procedure of RBI Grade B Examination will consist of Prelims and Mains Examinations where applicable. The Exam Pattern of the Prelims and Mains Examinations are provided here. The RBI Grade B Preliminary Examination will be an Objective type Computer Based Examination consist of 4 sections as mentioned below. Candidates clearing Sectional and Overall Cut-off will be able to appear for Phase II (Mains) Examination. Upon clearing Phase II Mains Examination, the candidates will be called for the Personal Interview if applicable. The Personal Interview will carry 50 marks. Final Selection of the Grade B Officers will be based on the cumulative score in Phase II and Interview.